While scouring the Apple iTunes app store, I stumbled across the BUPA Fitness App. Checking their website, I noticed that BUPA made their very own branded QR-Code. I think it’s one of the most promising branded QR-Codes I have seen. What they’ve done is basically make all black squares transparent and place a background behind the QR-Code. In the center, we can then see the BUPA logo. Hopefully this will set the standard for others. If only they had tracked their scans, the stats of how many scanned their QR-Code would have been invaluable when trying to encourage others to suit. 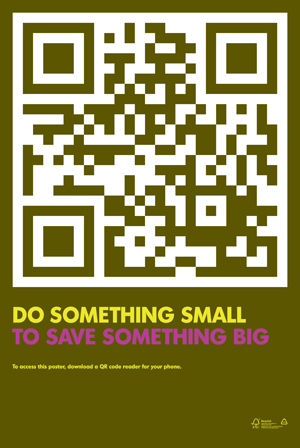 Another awareness based use of QR-Codes, The Big Wild have placed QR-Codes on posters for users to scan with the intention of raising awareness for a petition to protect the Flathead River and Restigouche Watershed. Boasting as the first environmental group to adopt QR-Codes, Darren Barefoot of The Big Wild hopes to generate interest with what some people class as a rarely used technology. Once scanned, the QR-Code takes you to a webpage focused on the Flathead River Valley. For non-Canadians, the Flathead River Valley is a large swath of wilderness. Billboards, magazines and posters certainly seem to be where QR-Codes are used most. For such a small advertorial space, a QR-Code can generate interest beyond the marketing message itself, which is a dream to anyone in the industry. What’s better, if you track your QR-Code scans you get quantifiable statistics which can say a thousand words. Want to see what the fuss is about? Get a QR-Code reader today and scan the experience. We’ve been alerted to a video posted on YouTube where Janette Force, Executive Director Port Townsend Film Festival describes how scanning a strategically placed QR-Code on their marketing posters will enable smartphone users to watch 25 trailers of films. We think it’s a good use of QR-Code marketing. We’ve not got our hands on a poster to scan yet, but let’s hope they have implemented tracking to decipher how successful the campaign was – Janette, if you’re reading this, we would love to have an exclusive on those stats. If you love QR-Codes and use Google Chrome, im sure you’ll be delighted with a new Chrome extension that enables you to create a QR-Codes for a current page, selected text or link. Having tried the QR-Code extension out briefly, we agree with the author and comments thinking it’s a perfect way for allowing you to quickly save links or text to your mobile phone without having to send yourself an email or SMS. You select a link, get your mobile phone out, scan the QR-Code for future use. One commenter suggested they use this method for their grocery shopping – a very innovative use by our standards. Don’t worry Firefox fans, there is already a similar extension that achieves the same. Sorry Internet Explorer users, you’ll have to do without for now. Let’s say you work in a museum and you are looking to place a QR-Code next to every artifact that allows users to scan and learn more about that artifact. This could be achieved by creating a QR-Code containing a URL which takes the user to a mobile friendly version of the musuem/artifacts website. But, what if you need to change the URL contained within the QR-Code? How could this be achieved without changing the QR-Code itself? Well, you could consider making use of a redirect (commonly known as a URL forwarder). You could then place the QR-Code containting the redirect wherever you like. If your desired destination of the webpage or URL changes, you can then alter the redirect to reference the new webpages location; we have not changed the URL in the QR-Code, just the destination it redirects too thus solving our conundrum.